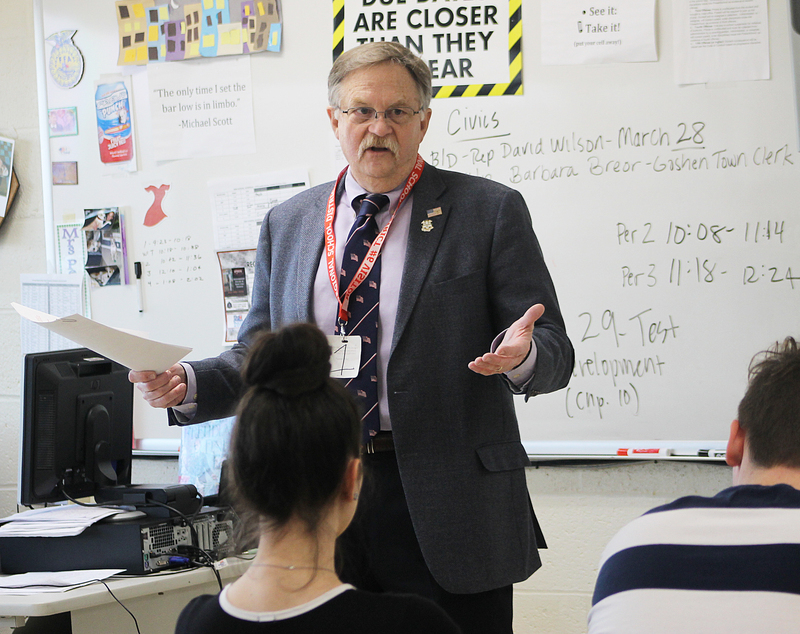 Litchfield – State Rep. David T. Wilson (R-Litchfield) was invited to meet with students at Wamogo Regional High School where he lead a civics discussion over two class periods. Students were invited to submit questions to Rep. D.T. Wilson prior to his visit to the school, much of the discussion was based upon their legislative inquiries. The students at Wamogo asked additional questions about the political climate in Hartford and how certain policies are prioritized. Regardless, Rep. D.T. Wilson also stressed the importance of civic engagement. The best way to make an impact is to participate in the process. That includes voting, but it also means contacting your state legislators, peaceful protest and staying up-to-date on critical issues by periodically checking state resources. To learn more about the state legislature you can go to: cga.ct.gov; to learn more about Rep. D.T. Wilson you can go to: RepWilson.com.